The new Cluster Concept line, presented this year at Eurocucina, proved to be a winner for Fulgor Milano and the FCLPO 6215 P TEM BK multifunction oven was awarded the Archiproducts Design Award 2018. This edition of the international design award saw the participation of 600 products from over 400 international brands from 15 countries. The jury, composed of 40 experts of international standing from the industrial, design, media and of course the Archiproducts staff, examined the candidate products in the 14 categories envisaged. 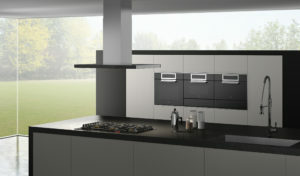 The Oven Cluster of Fulgor Milano won the award in the Kitchen category. “We are very proud to have won the Archiproducts Design Award for the second year in a row – Gianni Meneghetti, general manager of Fulgor Milano, commented -. The new Cluster line offers a very advanced technology able to be perfectly conjugated with the style and aesthetic taste that represents our country and gives us shine in the whole world”. All the cooking appliances of this line are integrated with the innovative Creactive Extended (TEM) technology, through which the selection phase of the functions is optimized. In fact, the user finds on the left of the panel the functions that he accesses intuitively and on the right the manual programming menu. In particular, the FCLPO 6215 P TEM BK oven is characterized by the Classic Pizza function, with which the temperature can be raised up to 350°C, that of a professional wood-burning oven, to cook 2 pizzas in 2′ and 35″ at the same time. The safety is guaranteed by the construction of the four-glazed door that remains below the hot temperature, despite the high internal temperatures, even during the pyrolysis cleaning cycle. The pizza oven Cluster also comes as standard with the refractory plate, which allows the passage of hot air between its two sides, allowing more uniform heat distribution and a homogeneous cooking of the different parts of the pizza, the round perforated steel grill and the blade to insert and extract the pizzas on the various shelves inside the oven. The oven is completed by a software with predefined recipes, which can be modified and saved by the user, as well as by a tray in thermal glass (baking dish) and the probe for measuring the temperature in food.